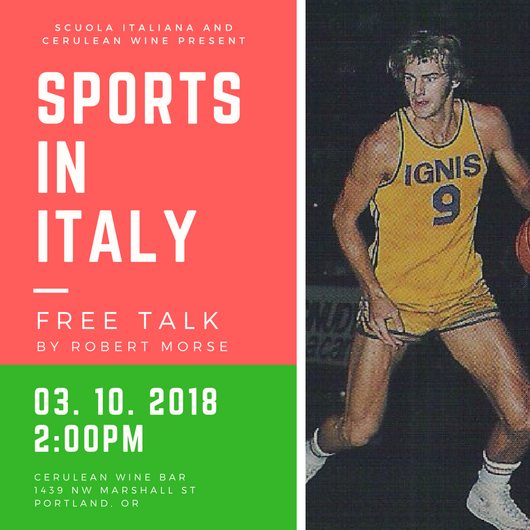 Join Scuola Italiana di Portland and Cerulean Wine Bar for a FREE discussion on Sports in Italy by Robert Morse on March 10, 2018 at 2:00pm. Enjoy delicious local wine while learning about Italian culture! Sports in Italy? Most people think of Italyâ€™s passion for calcio (soccer) â€“ their World Cup victories and the famous Italian Serie A teams such as Juventus, Milan, and Roma. In this sports-crazed country, however, there is much to understand and appreciate by going beyond soccer. Bob Morse will talk about other sports, as well as calcio, the similarities and differences between sports in Italy and the United States, especially in their organization and culture, with focus on Italian basketball. Bob played for eleven years for the Italian teams in Varese and Reggio Emilia, and in 2008, he was named one of the top 35 players in the history of European basketball. He currently teaches Italian for the Scuola Italiana di Portland, after a career as Senior Lecturer of Italian language, literature and culture at Saint Maryâ€™s College in Indiana. His talk will interweave some of his firsthand experiences in Italian basketball with insights into how sports reflect cultural differences between the U.S. and Italy. No registration required. Please forward this event to anyone who might be interested.